An Aviva spray tan provides your skin a warm radiance that makes you glow with beauty – on the inside and out. It instantly provides you with the most dramatic, non-surgical way to improve your appearance and your confidence. 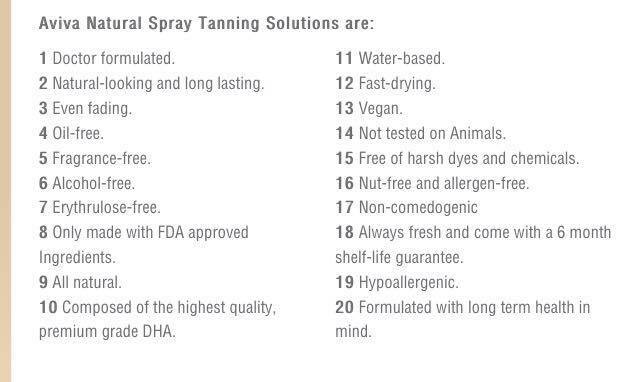 Looking for a tan without the hassle of having to wait a full 8 hours before showering or getting wet? This tan is for you! With this new innovative formula, you can shower in as little as 30 minutes (dependent on skin tone)! It’s Natural – You get a flawless, even tan that looks like you spent hours at the beach. It’s Easy – How can something so convenient and quick make such a dramatic transformation to your body, mind and spirit? All in 15 minutes. It’s Safe – Hypoallergenic, oil-free, alcohol-free, fragrance-free and contains ECOCERT-Certified DHA, it’s endorsed by the American Cancer Society, The American Academy of Dermatology, The America Medical Association and FDA approved. It’s Customized – Our spray tan pros will consult with you and choose a solution perfectly suited to your skin type and pigment. It’s Age Defying – A sunless tan gives you a natural glow that can make anyone look years younger. It’s Slimming – Your spray tan leaves you looking more slim and contoured. Don’t you owe it to yourself to try it? Call us for more details today! Shower, shave, and exfoliate (with Aviva Labs Exfoliant) 8-12 hours before session. Pay extra attention to dry areas such as elbows, knees, and feet. Do not apply any deodorant, makeup, or lotion prior to your session. This can affect your tan development. Bring a dark swimsuit or undergarments to tan in that are not your best. Wear dark, loose fitting clothes and flip-flops. Remove contact lenses and jewelry. Make sure skin is dry prior to getting dressed.. Wait between 6 and 12 hours to shower or exercise, the longer the better. You must allow time for the solution to react with the amino acids in your skin. The cosmetic bronzer will wash off in the first shower. This is normal and is not your tan. Avoid anything else that may cause you to perspire or get wet. Apply a DHA tan extending lotion such as Aviva Labs Sunless Tanning Gel and Skin Glow after showering. Moisturize twice daily. Hydrated skin retains tan longer. Avoid harsh scrubbing and long, hot baths. Pat your skin dry.